The Minnesota Vikings have re-signed linebacker Chad Greenway, who will return for what he says is his final season in the NFL. 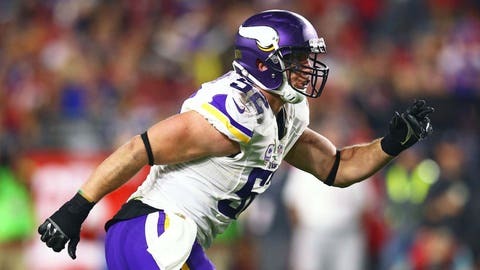 EDEN PRAIRIE, Minn. — The Minnesota Vikings have re-signed linebacker Chad Greenway, bringing their former first-round draft pick back for an 11th and likely final season. The deal was agreed to last month and finalized Monday. Greenway is fourth among linebackers in Vikings history with 135 career starts, trailing Scott Studwell and Roy Winston (160) and Jeff Siemon (149). The two-time Pro Bowl pick, who joined the team as the 17th overall selection in 2006 out of Iowa, is also fourth all-time in tackles in Vikings history. He’s trailing Studwell, Matt Blair and Siemon on that list. Greenway’s role was reduced last year, with linebackers Anthony Barr and Eric Kendricks the every-down players. Greenway and Emmanuel Lamur will be in the mix at weak-side linebacker.